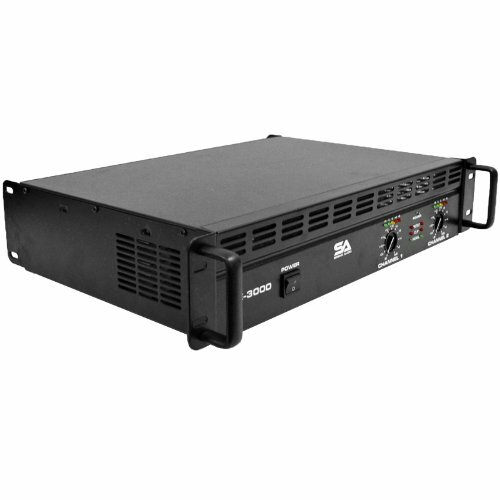 Power Amplifier - 3000 Watts - Model Number: LE-3000, Power Handling: 2 x 350 Watts @ 8 Ohms, 2 x 700 Watts @ 4 Ohms, Momentary Peak Output 3000 Watts @ 8 Ohm Bridge. , Features Input Gain (dB), Power LEDs, Signal Activity LEDs (Signal), Overload LEDs (Fault), Power Switch, Channel 1 & 2 Level LED Indicator, Cannon and Input Jack Connector, Mode Switch, Ground Left Switch, Binding Post Outputs, Power Select 110V-120V or 220V-240V Power Supply, Power Input IEC Power AC, Fan Grill Two 2 Speed DC Fans. Specifications: Input Impedance Balance: 20K ohms, Non-Balance 10K ohms, Frequency Response: +0, -0.2 dB, 20Hz to 20KHz, Frequency: 60/60 HZ, Input Level +4 dB, Input Voltage: 115/230V AC, Dimensions: 19" W x 13" D x 4" H, Weight: 13 lbs. . Our LE Series amplifiers are designed for the professional DJ & entertainers that need quality power, but have a limited budget. Every LE Series amplifier provides excellent performance for all speakers. Features included with the LE amps are Input Gain, Ground Lift Switch to eliminate hum, Power LEDs, Channel 1 & 2 level, LED's indicator, stereo, parallel mono and bridge modes, clip indicator, as well as dual DC fan for efficient cooling to prevent overheating.